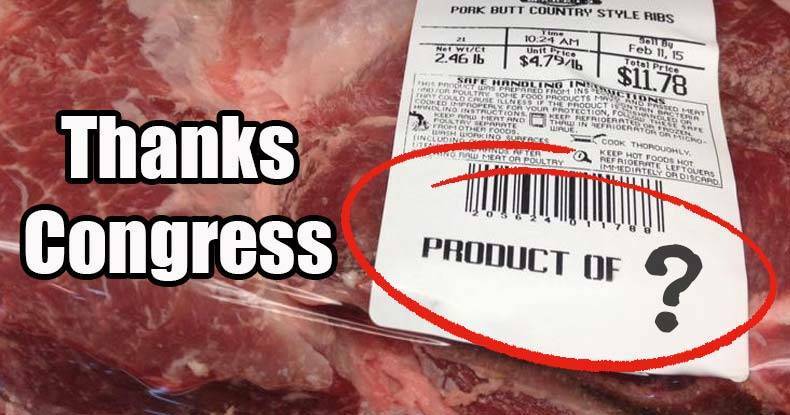 Washington, D.C. – It will soon become almost impossible to know where your pork or beef was born, raised or slaughtered, due to Congress repealing a labeling law that required retailers to include country of origin on pork and beef products. Lawmakers claimed to have had little choice but to lift the labeling requirements after the World Trade Organization’s continual rulings against the U.S. labels. The labels were challenged by Canada and Mexico in the WTO, with the organization authorizing those countries to begin fining the U.S. over $1 billion in economic sanctions. The lawmakers’ explanation, as to their reasoning for getting rid of the labels, lends direct support to the argument that U.S. sovereignty is being lost by membership in certain international organizations. If a transnational trade organization has the ability to dictate U.S. law to those that are tasked with representing the people of a nation, then sovereignty is most certainly an extremely fluid concept the deeper a nation ventures into the land of international organizations. The repeal also was a big defeat for lawmakers from northern border states where U.S. ranchers directly compete with Canadian ranchers. The labeling law repeal, along with other controversial legislation such as CISA, was included within the omnibus spending bill that Congress passed late last month to avert a government shutdown. The insertion of legislation, that would otherwise never be codified into law, into a spending bill that most in Congress see as integral to pass, speaks to the nefarious nature of “representative” democracy as practiced in the U.S. It also highlights the ability to subvert the very foundations we are told the nation was built upon by those intent on substituting their will for that of the people. The meat industry savored the victory after fighting to repeal the labeling law in Congress and the court since the day it was passed in 2002, due to concerns about mad cow disease in imported cattle. Labels weren’t added to most packages of meat until 2009, due to repeated delays instigated by the meat industry. Consumer groups say the repeal is a major blow to consumers. With shoppers increasingly wanting to know more about their food, it seems illogical to give them less information about the food they purchase. There was a sliver of good new for labeling advocates in the spending bill, as Congress chose not create a law to block the mandatory labeling of genetically modified products… for now. With a Vermont genetically modified labeling law set to take effect this summer, which will require labeling on all GMO food products, the issue is certain to be a source of controversy and debate for the foreseeable future. Roger Johnson of the National Farmers Union, said the group was “furious” about the repeal. One thing is certain; it was definitely no gift to the American public.